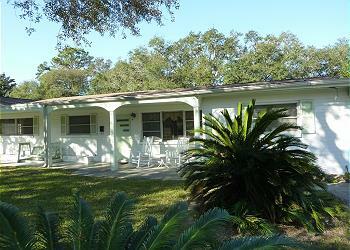 4 bedrooms, 2 bathrooms, living room, kitchen, dining room, screened porch, single carport. MW, DW, W/D, 3 Satellite TVs, DVD, Gas Grill. POOL PASS @ DAYS INN. NO PETS, NO SMOKING. BEDS: 2 Queen, 1 Double, 2 Single. Accommodates 8. As always we had a great time at Jekyll Island and hated to leave. Been coming there for about 40 years. Overall clean / just on ceiling by air vents had black dirt. The kitchen was well equipped and up to date. Geeay laundry area. Central air didn’t cool house well and we were often warm and uncomfortable. All the furniture on the screened in porch was filthy and had to be cleaned before sitting and eating. That should get cleaned when house is cleaned. We have stayed at this rental over 3 times & have been pleased every time. Great location, love the layout of the rooms & always has been very clean. Would suggest to anyone interested to consider staying at the Blue Heron. Walk to beach very convenient. Bike riding around the island. Saw dolphins, pelicans, turtles, maybe a manatee? Wonderful island with lots of nature and time in the sun and sand! This is house is great. It has plenty of room and a large kitchen. It is well equipped and clean. We thoroughly enjoyed staying in this house. We have stayed here previously. It was wonderful so good we are coming back in September!!!! !